Our CSA veggie boxes will resume on the 6th January 2018 and run for 30 weeks until 28th July 2018. Our family sized boxes our large enough for an average family of 4 cooking most meals at home and generally have 10-12 different veggies per week. The cost for the full 30 week season is $1200, and average weekly cost of $40, which can be paid in full in advance and save 5% or by 6 monthly instalments of $200. Delivery/pick up days will be Saturdays, and all produce will be harvested the Friday before. We have pick up hubs in the Upper Yarra Valley, Warrandyte and Eltham at this stage, but can establish new ones in outer eastern suburbs where there is enough demand. Please contact us with any queries or to confirm your box for 2018. We look forward to sharing our harvest with you. As the organic food sector experiences rapid growth in consumer demand year after year, the rush is on for the environmentally destructive corporate food industry to grab a piece of the action. More and more industrial scale conventional farms are attempting to attain organic certification, and whilst this could be seen as a positive outcome, the trend of organic farming towards the corporate “agribusiness” model and away from “agriculture”, is something to be very worried about. These so called organic farms are still essentially monocultures doing the bare minimum to qualify organic certification, are still dependent on energy intensive large machinery and production inputs. Whilst still an improvement on convention farming they are a long way from being truly sustainable. 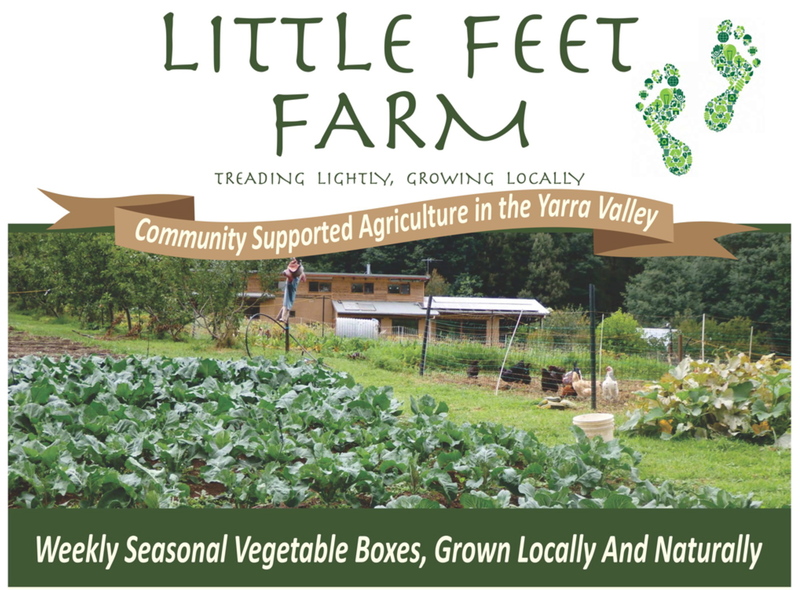 At Little Feet Farm we believe it is misleading to promote certified organic as the pinnacle of sustainable farming, and as such we believe there can be more sustainable food production, with better environmental, social, cultural and health outcomes “Beyond Organics”. To us beyond organics means supporting a myriad of varied and diverse, small scale sustainable farms, focused on supplying their local communities with the freshest seasonal nutrient dense food possible through farmers markets, CSA box schemes and local produce traders. It is small appropriate scaled farms growing varied high quality seasonal crops rich in health promoting nutrients, in detailed rotations, investing in and nurturing the soils on their farms, being intimately connected and rooted in the cycles of nature around their farms, bringing an attention to detail not possible on industrial scale farms. It is about farmers who know how to farm without poisons, use minimal inputs, conserving water, breed diversity of life into their farms both above and below the soil. Its about farmers as artisans and skilled crafts people leaving their farms in better conditions and valuable assets for future generations. Its about farmers being valued and respected in their communities and their communities supporting them to make fair and equitable income in return for them providing them health promoting fresh food. In essence it about building relationships between farmers and nature, and farmers and the community of people who eat their produce, enabling the community to become more knowledgeable about truly sustainable farming techniques, empowering them to judge for themselves the ethics and sustainability of the food they eat. And making the job of anonymous organic certifying bureaucrats redundant.